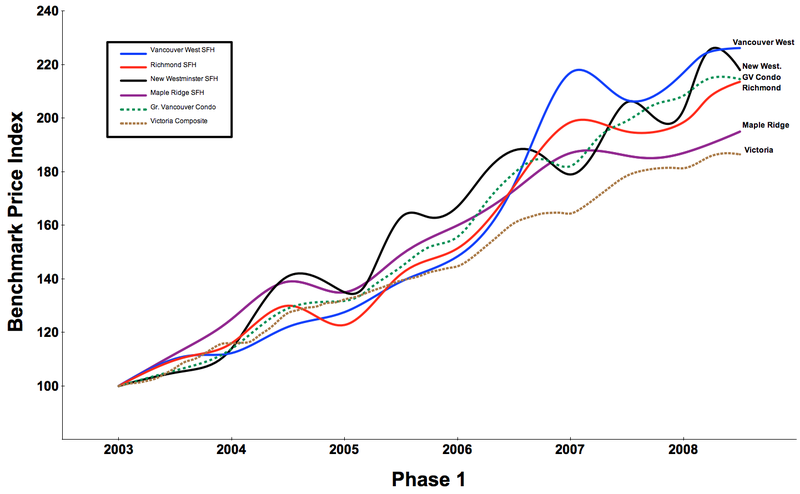 Trying to make sense of the Vancouver Housing Bubble. This argument is completely disingenuous. Very little about the current situation is the result of a free market. As I pointed out last month, the biggest obstacle to residential development isn’t the mountains, ocean or US border — it’s the Agricultural Land Reserve (ALR). 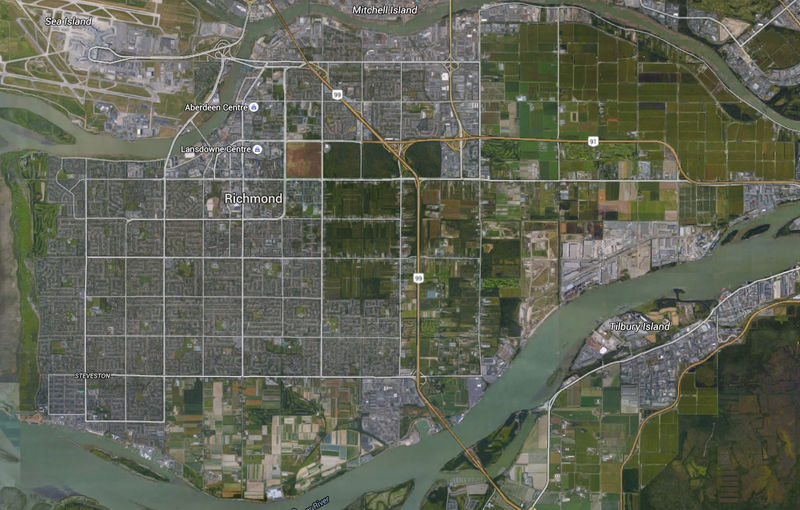 To illustrate the point, let’s take a detailed look at the City of Richmond. Here is an aerial shot of the city, where you can see that about 40% of the total available land has been dedicated to agricultural uses. 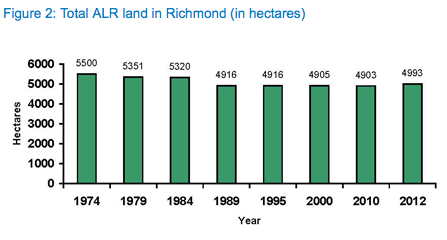 And even though the population of Richmond has increased by about 75,000 since 1989, the ALR within the city has actually increased slightly since then. Since the early 1970s when the ALR was created, the population of Metro Vancouver has more than doubled, and the average detached home has increased more than ten-fold! What started out as a good idea, is now creating more problems than it solves. There are approximately 211 farms operating on 3,072 hectares in Richmond. As of 2011, they were producing $48.6 million annually. Considering that fifteen standard single family homes can be built per hectare, each standard single family lot in the ALR is currently generating about $1,055 worth of crops per year — which probably translates into $200 of profit. When you further consider that the standard lot in Richmond is currently assessed in the neighbourhood of $800k, the effective yield on ALR land is only about 0.025%. Not a very efficient use of a precious resource! Property taxes for agricultural land are significantly lower than they are for residential properties. Taxes generated from this (admittedly small) sample average $398/ha. The average residential property is taxed at about $50,000/ha. Building houses on this land instead of growing crops could potentially generate an additional $150 million per year in tax revenue for the city. Of course, the biggest drawback of reserving so much land in the middle of the third biggest metropolitan area in Canada is inflated house prices. The median priced detached home in Richmond has now reached $1,155,500. More than $800k of that cost is just for the land. If the ALR wasn’t restricting development so much, a Richmond lot would cost several hundred thousand dollars less. In 2014, there were 1,692 detached home sales. Opening up just half of the ALR in Richmond to residential development would be enough to build over 30,000 detached homes — almost 18 years worth at current sales rates. And to anyone concerned that the loss of 2,500 hectares of ALR will damage our ability to feed ourselves, don’t worry. This is only 0.053% of the 4,700,000 hectares currently in BC’s ALR. The housing crisis in the Lower Mainland has reached a point where serious changes will need to be made. Since we are unable to affect interest rates — and the government seems unwilling to address foreign capital flooding into the region — it just might be time to re-evaluate the Agricultural Land Reserve. Forcing families to fork out several hundred thousand dollars more for a home so we can grow $1,055 worth of blueberries instead doesn’t seem like the wisest course of action. And it certainly doesn’t put families first. Now that it’s been shown high-end properties are appreciating more than lower priced homes, many are convinced that this is proof foreign capital is affecting Vancouver housing prices significantly. Others are downplaying the influence of foreign money and are claiming that lack of detached housing supply is responsible. At last month’s speech to the Urban Development Institute, Bob Rennie told the audience, “If we don’t change things from today’s climate of ‘I want a detached home in a city that can’t provide it,’ we could run the risk of our worst fear ever: a Vancouver city ending up as a resort city”. …prices for detached single-family homes are being driven upward by two factors that have little to do with real estate speculation and/or foreign ownership. Rather, it is because they aren’t building them any more in Vancouver and the existing stock is shrinking, owing to the trend toward densification, when detached homes are torn down and replaced with multiple dwellings. The supply is shrinking and everyone wants one? Of course prices are soaring. The problem with these statements from Palmer and Rennie is that they are only looking at the City of Vancouver, where single family homes are indeed decreasing in number. But this is true in older areas of just about every city — newer single family homes are built in the suburbs. 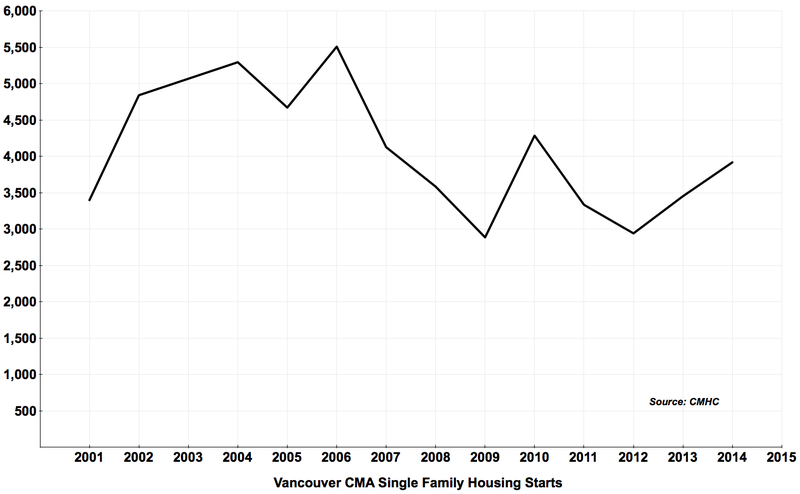 When you look at all of Metro Vancouver, thousands of single family homes are still being built each year. As far as the “trend toward densification” is concerned, it’s been going on for decades. Why have detached homes only recently appreciated more than condominiums? The recent rise in foreign capital flight correlates much more closely to these recent gains than the long-term trend of densification. 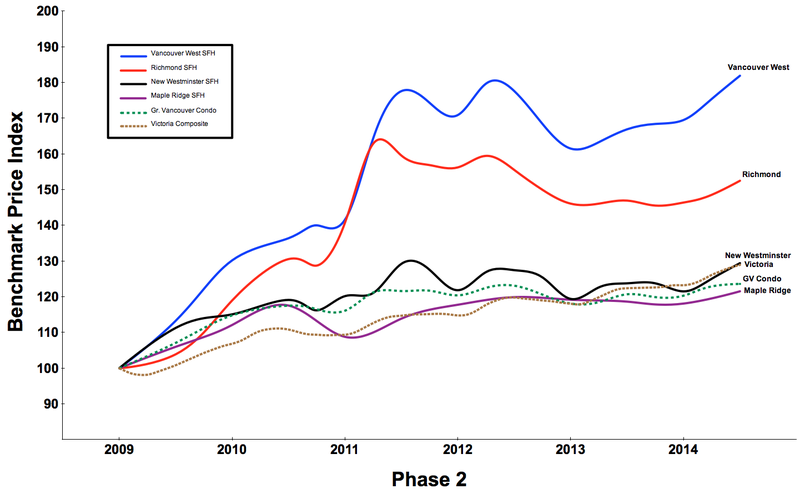 As mentioned in a previous post, the initial stage of the bubble (which I refer to as ‘Phase 1’) saw relatively equal rates of appreciation among all property types. However, in the second phase of the bubble, price movements have been diverging. Properties popular with foreign buyers have been appreciating much more than prices where locals are buying. Since 2009, single family homes in Richmond have appreciated 79% more than homes in New Westminster, while detached homes on the west side of Vancouver have appreciated a whopping 178% more. Why did this happen during in this second phase of the bubble, but not the first? If lack of single family home supply really is the problem, why haven’t detached homes in places like New Westminster and Maple Ridge appreciated more than the benchmark condo? What explains this recent divergence? As I concluded in my post from last month, all the evidence points to foreign capital driving the single family home market on the west side of Metro Vancouver — not lack of supply. Is it supply? Are we stupid?